Fed up with all the F'in Junk? Get rid of it! Call it a mess, a hassle, or "that F'in Junk" - no one likes junk cluttering up around their home, office, or jobsite. Getting rid of it can be a pain. 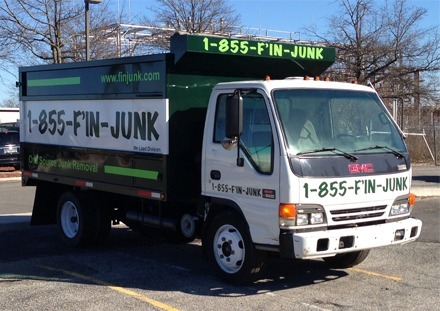 But 1-855-F'IN-JUNK has the solution. We make junk removal fast, easy, and cost-effective. We pick up on location at your home or business, and you won't even need to lift a finger. Just point out the junk, we'll load it into the truck and haul it away. We focus on making your life easier, and our success is built on our outstanding record of customer satisfaction. Got Junk at the house? Old TV, PC, or other e-waste? Recycle it! Office cleanup? Get it shredded & hauled fast! Tenants left a mess? Flood damage? We can help! Need it Shredded? Not a Problem! SafetyShred is the paper shredding & recycling division of 1-855-F'IN-JUNK. SafetyShred provides mobile document destruction service that's secure, efficient, and cost effective. And unlike shredding it yourself with a store-bought shredder, our equipment ensures complete destruction of your sensitive documents, protecting you from identity theft and confidential information loss.